For countless years, humans have gazed up at the sky and made sense of the stars by finding shapes in them — constellations of heroes, animals, and well-worn tales. Now, to celebrate the 10th mission year of NASA’s Fermi Gamma-ray Space Telescope, scientists have used the telescope to develop a new set of constellations that correspond with gamma-ray emissions [Future post]. The neutrino was discovered by an international team of scientists using the National Science Foundation’s IceCube Neutrino Observatory at the Amundsen–Scott South Pole Station. Fermi found the source of the neutrino by tracing its path back to a blast of gamma-ray light from a distant supermassive black hole in the constellation Orion. The discovery is the subject of two papers published Thursday in the journal Science. 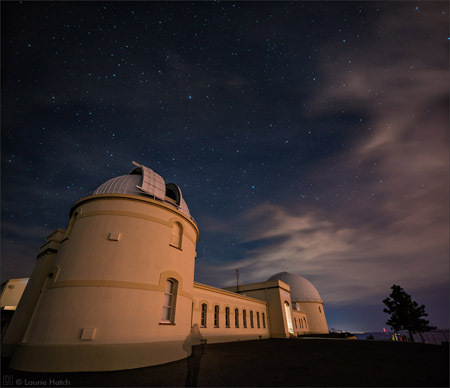 The source identification paper also includes important follow-up observations by the Major Atmospheric Gamma Imaging Cherenkov Telescopes and additional data from NASA’s Neil Gehrels Swift Observatory and many other facilities. The Fermi Gamma-ray Space Telescope , formerly referred to as the Gamma-ray Large Area Space Telescope (GLAST), is a space observatory being used to perform gamma-ray astronomy observations from low Earth orbit. Its main instrument is the Large Area Telescope (LAT), with which astronomers mostly intend to perform an all-sky survey studying astrophysical and cosmological phenomena such as active galactic nuclei, pulsars, other high-energy sources and dark matter. Another instrument aboard Fermi, the Gamma-ray Burst Monitor (GBM; formerly GLAST Burst Monitor), is being used to study gamma-ray bursts. The mission is a joint venture of NASA, the United States Department of Energy, and government agencies in France, Germany, Italy, Japan, and Sweden. An example composite image of 3C 279 convolved with a beam size of 0.1 mas (circle in the bottom left corner). The contours represent the total intensity while the color scale is for polarized intensity image of 3C 279. The line segments (length of the segments is proportional to fractional polarization) marks the EVPA direction. Credit: Rani et al., 2018. Using very long baseline interferometry (VLBI), astronomers have investigated the magnetic field topology of the blazar 3C 279, uncovering the presence of multiple gamma-ray emission regions in this source. 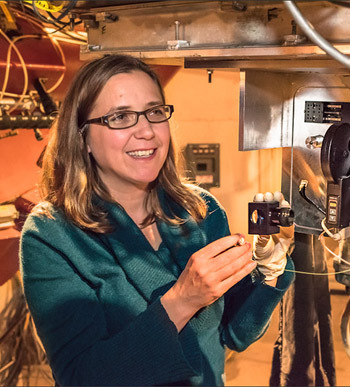 The discovery was presented May 11 in a paper published in The Astrophysical Journal. Blazars, classified as members of a larger group of active galaxies that host active galactic nuclei (AGN), are the most numerous extragalactic gamma-ray sources. Their characteristic features are relativistic jets pointed almost exactly toward the Earth. In general, blazars are perceived by astronomers as high-energy engines serving as natural laboratories to study particle acceleration, relativistic plasma processes, magnetic field dynamics and black hole physics. NASA’s Fermi Gamma-ray Space Telescope is an essential instrument for blazar studies. The spacecraft is equipped with in the Large Area Telescope (LAT), which allows it to detect photons with energy from about 20 million to about 300 billion electronvolts. So far, Fermi has discovered more than 1,600 blazars. A team of astronomers led by Bindu Rani of NASA’s Goddard Space Flight Center has analyzed the data provided by LAT and by the U.S.-based Very Long Baseline Array (VLBA) to investigate the blazar 3C 279. The studied object, located in the constellation Virgo. 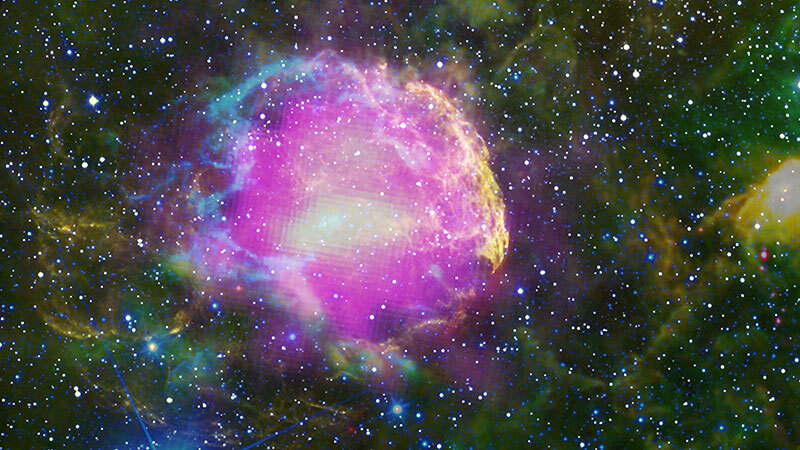 It is one of the brightest and most variable sources in the gamma-ray sky monitored by Fermi. The data allowed Rani’s team to uncover more insight into the nature of gamma-ray emission from this blazar. 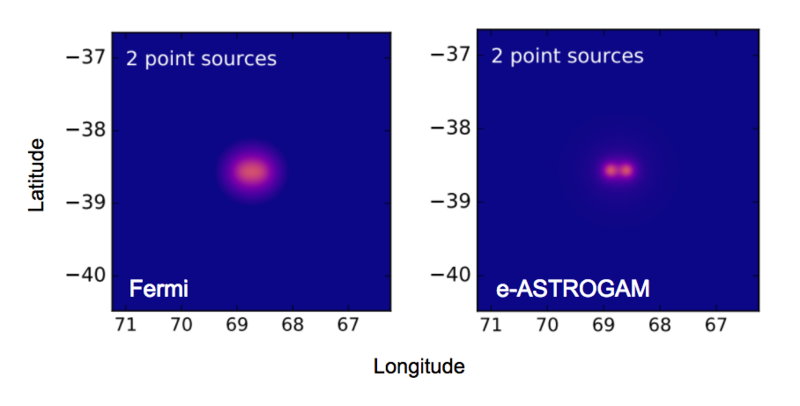 “Using high-frequency radio interferometry (VLBI) polarization imaging, we could probe the magnetic field topology of the compact high-energy emission regions in blazars. A case study for the blazar 3C 279 reveals the presence of multiple gamma-ray emission regions,” the researchers wrote in the paper. Six gamma-ray flares were observed in 3C 279 between November 2013 and August 2014. The researchers also investigated the morphological changes in the blazar’s jet. The team found that ejection of a new component (designated NC2) during the first three gamma-ray flares suggests the VLBI core as the possible site of the high-energy emission. Furthermore, a delay between the last three flares and the ejection of a new component (NC3) indicates that high-energy emission in this case is located upstream of the 43 GHz core (closer to the blazar’s black hole). The astronomers concluded that their results are indicative of multiple sites of high-energy dissipation in 3C 279. 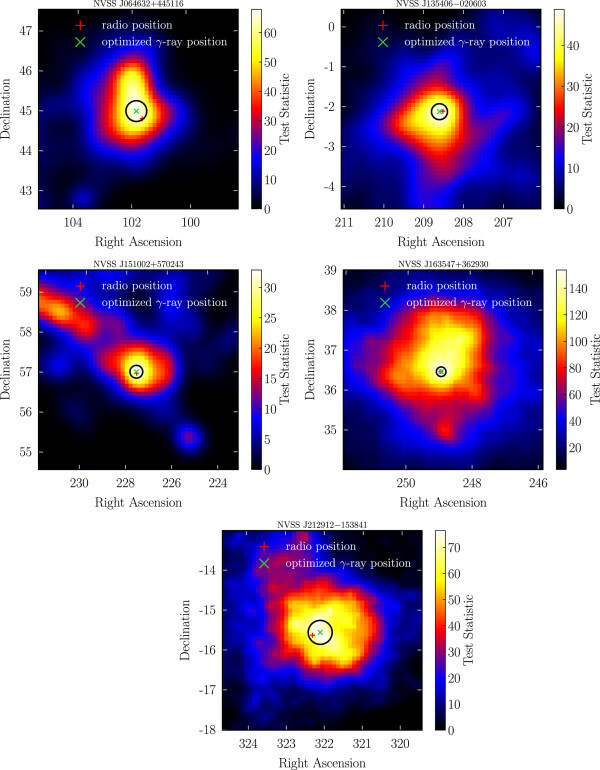 Moreover, according to the authors of the paper, their study proves that VLBI is the most promising technique to probe the high-energy dissipation regions. However, they added that still more observations are needed to fully understand these features and mechanisms behind them. “The Fermi mission will continue observing the GeV sky at least for next couple of years. The TeV missions are on their way to probe the most energetic part of the electromagnetic spectrum. High-energy polarization observations (AMEGO, IXPE, etc.) will be of extreme importance in understanding the high-energy dissipation mechanisms,” the researchers concluded. A team of astronomers involving The Australian National University (ANU) has discovered that a mysterious gamma-ray signal from the centre of the Milky Way comes from 10 billion-year-old stars, rather than dark matter as previously thought. Co-researcher Dr Roland Crocker from ANU said the team had a working hypothesis that the signal was being emitted from thousands of rapidly spinning neutron stars called millisecond pulsars. “At the distance to the centre of our galaxy, the emission from many thousands of these whirling dense stars could be blending together to imitate the smoothly distributed signal we expect from dark matter,” said Dr Crocker from the ANU Research School of Astronomy and Astrophysics. Dr Crocker said the findings ruled out a provocative theory that dark matter, which is not well understood by scientists, was the origin of the gamma-ray signal. 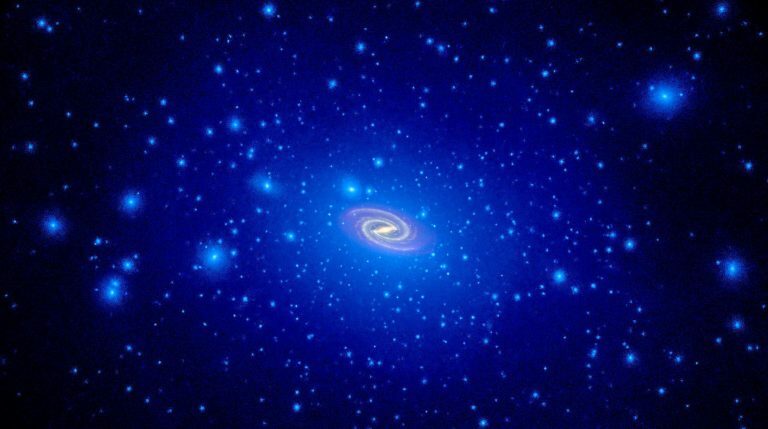 “It is thought that dark matter is composed of Weakly Interacting Massive Particles, which would be expected to gather in the centre of our galaxy,” Dr Crocker said. The Fermi Gamma-Ray Space Telescope, which has been in a low Earth orbit since 2008, has given scientists their clearest ever view of the gamma-ray sky in this energy range. “While the centre of our galaxy may be rich in dark matter, it is also populated by ancient stars that make up a structure called the Galactic bulge,” Dr Crocker said. He said the signal detected by Fermi closely traces the distribution of stars in the Galactic bulge. “Ongoing observational and theoretical work is underway to verify or refute the hypothesis that the gamma-ray signal comes from millisecond pulsars,” Dr Crocker said. 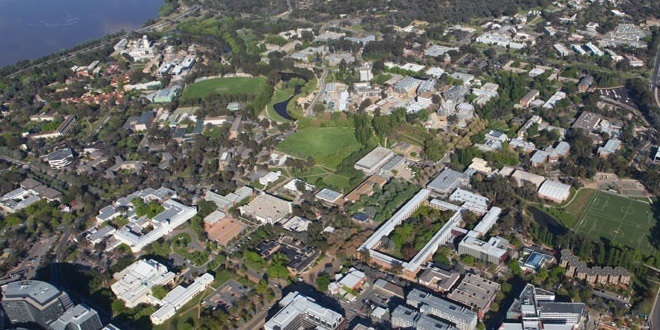 ANU and research institutions in the United States, New Zealand and Germany conducted the study, which was led by Virginia Tech in the US. Due to a recent software improvement, the Large Area Telescope (LAT) on board the Fermi Gamma-ray Space Telescope has discovered five gamma-ray blazars at high redshifts, opening a window to the early universe. Quasars, the active centers of some distant galaxies, shine brightly across the electromagnetic spectrum. These luminous objects are fueled by material accreting onto a supermassive black hole, and the release of energy in this accretion launches powerful jets that, in the case of a type of quasar called a “blazar”, point along our line of sight — causing them to be relativistically boosted to look especially bright. The jet radiation dominates blazar broadband emission, especially at gamma-ray wavelengths. Fermi-LAT has detected thousands of blazars in gamma rays; in fact, blazars have been found to be the most numerous gamma-ray population in our sky. 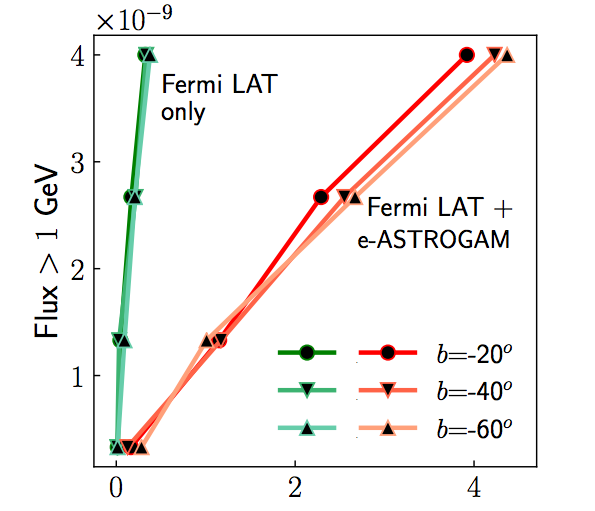 In spite of this, Fermi hasn’t found any gamma-ray blazars at a redshift greater than z = 3.1 — likely because at this distance, the blazars’ gamma-ray emission is redshifted to lower frequencies at which the LAT is less sensitive. A recent, spectacular set of improvements to Fermi data analysis, however, known as Pass 8, has substantially enhanced the sensitivity of LAT to gamma rays across the spectrum — with particular improvement at lower frequencies. Motivated by this increased sensitivity, a team of Fermi scientists has used the data from Pass 8 to search for especially distant gamma-ray-bright blazars. The Fermi team began by selecting high-redshift radio-loud blazars from a known catalog of over a million quasars. They then searched for these ~1100 sources within the 92 months of LAT data produced by Pass 8. 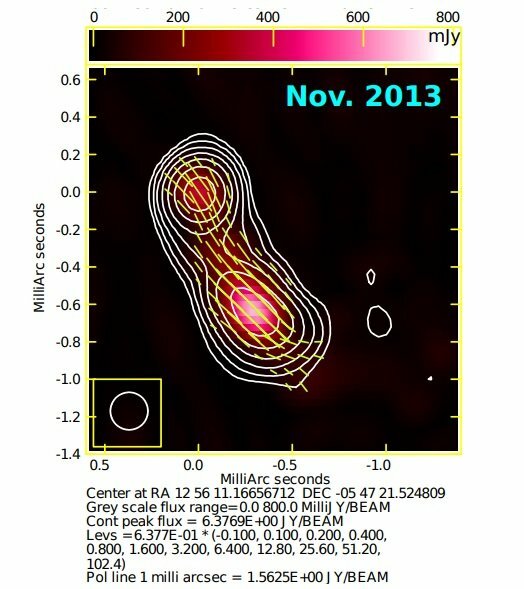 This systematic search led to the detection of five new gamma-ray sources consistent with the positions of blazars at redshifts greater than z = 3.1 — including NVSS J151002+570243, which now qualifies as the most distant gamma-ray blazar known, at a redshift of z = 4.31. Analysis of the sources’ spectral energy distributions verifies that they have all the properties expected of especially powerful blazars, confirming their identity. Modeling of their spectra suggests they harbor massive black holes in the range of hundreds of millions to tens of billions of solar masses. The properties of these sources allow the authors to estimate the space density of massive black holes hosted in jetted systems: roughly 70 per cubic gigaparsec. Though these five new gamma-ray blazars may constitute a small sample, they provide information that can be used to begin to constrain our models of how supermassive black holes formed in the early universe. They’re also a shining example of the remarkable benefit possible with clever software improvements!